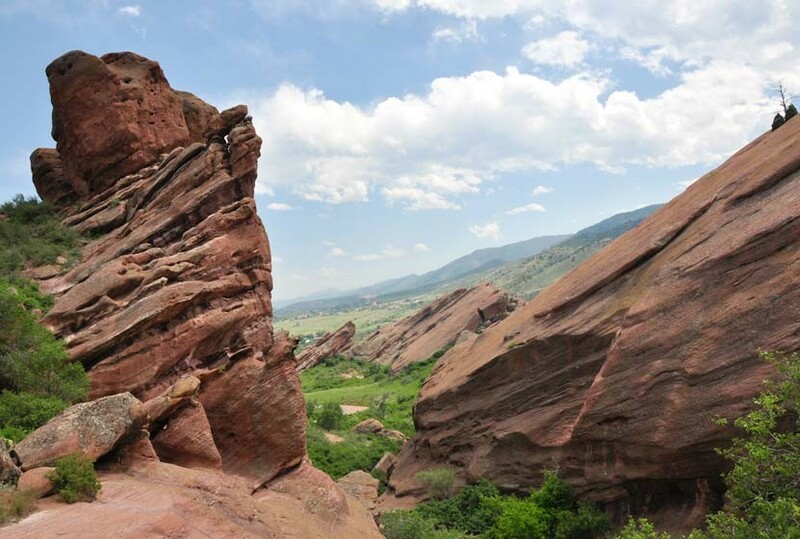 Ready for a hike around Colorado’s Red Rocks Park and famous amphitheater? 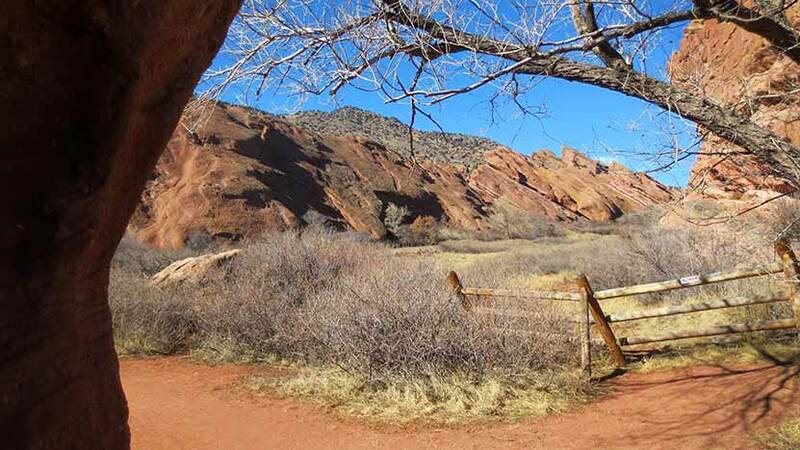 The Trading Post trail at Red Rocks takes you around 10 of the parks giant red rock formations. It’s a short loop hike near Denver, accessible off of 470. 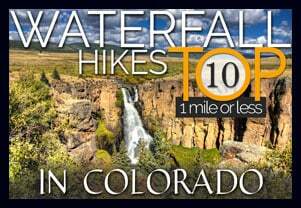 Check out our full hiking trail profile below for all the details. 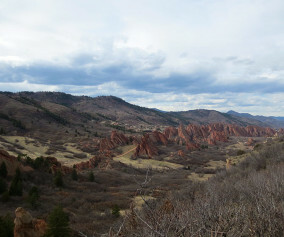 If you are looking for a family adventure that’s quick to get to, this hiking trail at Red Rocks is a great option. 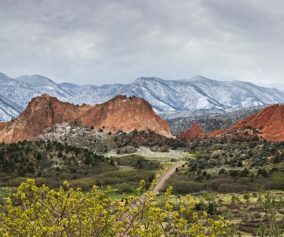 The Trading Post trail weaves through some of Colorado’s most majestic red rock formations, into meadows, and great views of Red Rocks park. Because the trail is narrow and has some steep areas, keep a good eye on the kiddos. We hiked the Trading Post Trail on a sunny Saturday in February with our children, ages 7 and 4. They loved it, but were definitely tired at the end. However, after we finished the 1.4 mile loop, it was their idea to hike up to the amphitheater, then all the way to the top. We started at the trading post, and hiked the loop counter-clockwise. I’d recommend hiking it this way because it gives you the move favorable views, and offers a bit of shade about 3/4 of the way through the hike–right when you need it the most. The sand and grave on the rock surface of the trail can cause your feet to slip, but as long as you are aware and take your time, it makes for a perfect leisurely hike. 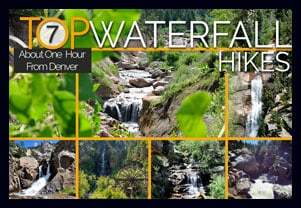 You can bring your dog on this hike, however we haven’t added this trail to our list of best trails for hiking with your dog near Denver because the trail can be narrow and can be high traffic. So, if you are bringing fido, we recommend going early in the morning, or take the Red Rocks trail, which is more open and has fewer people on it. I get a lot of emails from people who are only in Denver for a few days, limited when it comes to their transportation, and want to experience the outdoors. This is the hike I send them to. Why? The Trading Post is gorgeous year round. Red Rocks is super close to Denver, and while it’s still expensive, you could take a Lyft or Uber there from downtown. Get a group of friends to share the cost and you’re golden. 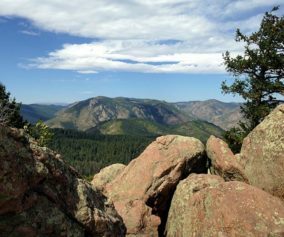 Elevation is less of an issue for out-of-towners, and it’s a relatively easy hike. It’s short, but long still long enough to get a workout. Rattlesnakes: There are rattlesnakes in Red Rocks, as there are in many parks along the front range. Like us, they love to sunbathe, but on rocks and other warm areas. Don’t let their presence deter you from enjoying this hike, but keep an eye out for the varmints. 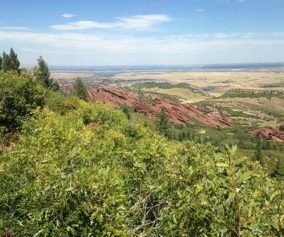 View of Denver: After your hike around the Trading Post loop, walk up into the Red Rocks Amphitheater. 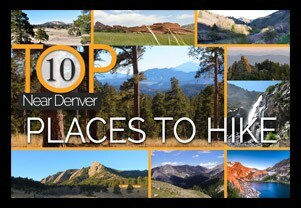 It’s worth climbing all the stairs to the top for a great view of Denver.